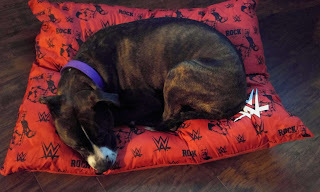 WWE fans can now share their passion with their pets as Petmate, the worldwide leader of solutions and excellence in the pet industry providing fun trusted, quality products to enhance the lives of pets and their families, announces the launch of its new collection of WWE pet products available at retailers nationwide. The new collection features iconic pet beds, fan favorite collars and leashes, and assorted rough and tough rubber and plush toys, capturing the excitement of WWE. 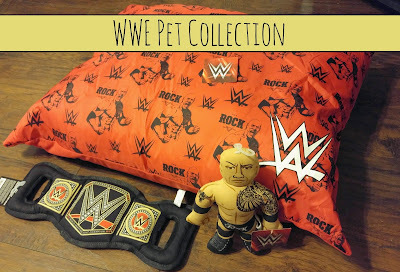 Showcasing the brand’s mega-themes and fan-favorite Superstars including WWE Superstars John Cena and The Rock, and WWE Hall of Famer Stone Cold Steve Austin, the collection is now on pet store shelves near you and online. For more information visit Petmate.com. Perfect bed for pooches to relax on instead of a hardwood floor. Both my dogs loved it so much that they were fighting over who got to lay in it! 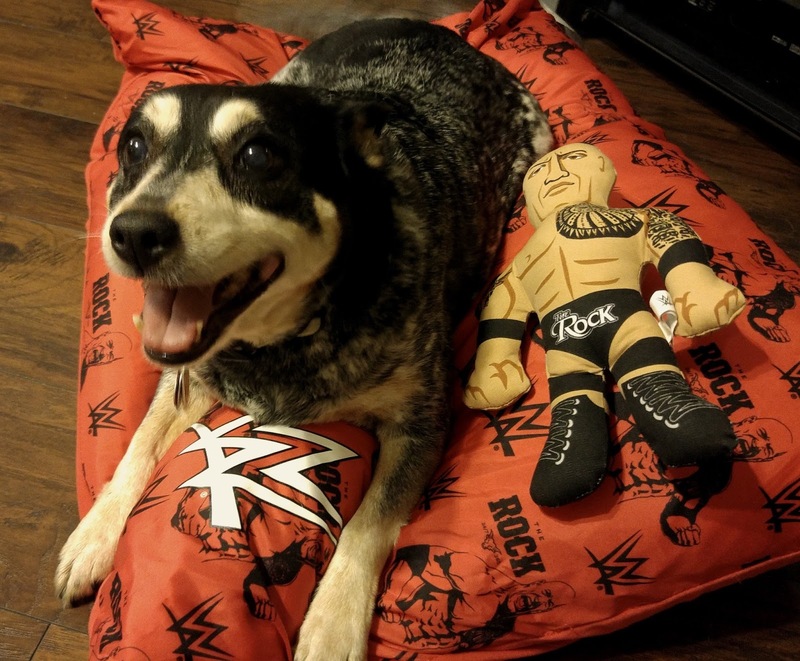 With WWE Plush Superstars, your dog can wrestle with the greatest. These tough canvas toys feature popular Superstars including The Rock, John Cena and Stone Cold Steve Austin. Each toy also has a squeaker inside for added excitement during playtime. The WWE Tug Toys are designed for tough tug play between you and your dog, or for two dogs to wrestle and tug together! Features the iconic WWE or Divas Championship belts and Money in the Bank Brief Case. 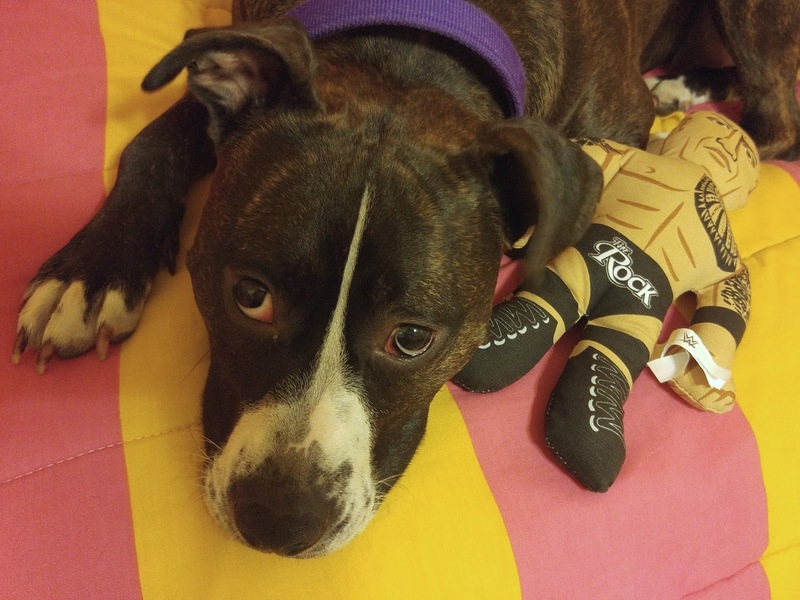 Our Roxy featured above destroys toys. Not too many pet toys last in our house as the minute she gets it, she wants to tear it open. Not so with these WWE toys. They are durable and she loves playing with them. We recently got a kitten and the kitten loves to put out the Championship Belt toy and use it as a scratching toy. He will ever go to town clawing at the Rock. So they WWE toys can stand up against a dog who likes to destroy toys and a crazy kitten!